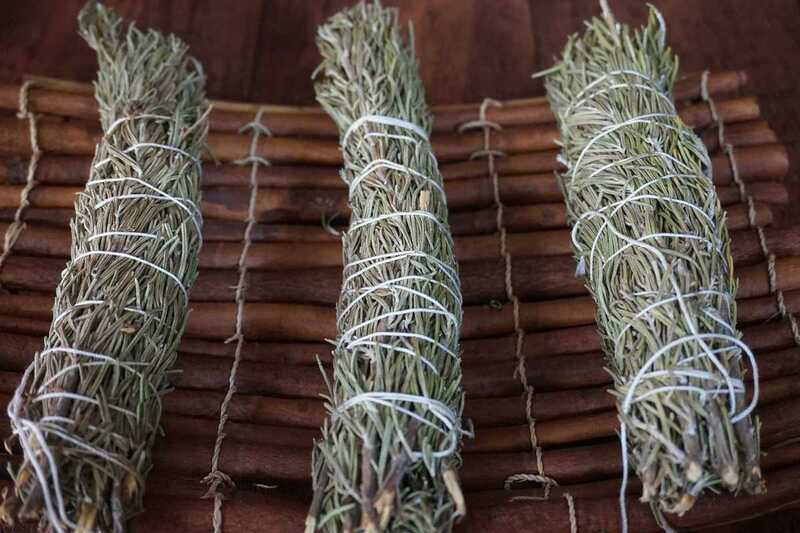 Smudge sticks are wrapped fresh plants that are left to dry. They are then burned for different experiences, but traditionally to purify and protect a person or space. Though they’re available to buy in stores, I find the energy is stronger with the smudges you make on your own. You can gather them on a hike through the woods, mountains or even in your own garden. That way, when you burn your smudge, you can remember a pleasant place or time of year. In Catalunya, herbs such as thyme and rosemary are easily accessible in the countryside; and because they are local, they evoke the energy of the land we live in. Thyme is considered a feminine plant, associated with the planet Venus, and for this reason it is not only burned to purify but also often used when matters of the heart are involved. Rosemary, or dew of the sea, is a masculine plant, associated with the sun. Also burned for purification, it is closely associated with remembrance.